I moved to Sydney a month ago to start a new job--just as I scratched through the bottom of the money jar. Even though I'd gone beyond my savings I pulled out my credit card and booked a flight to be back in my home zone, the cold yet beloved Victoria. My reason for ensuring my return this weekend... 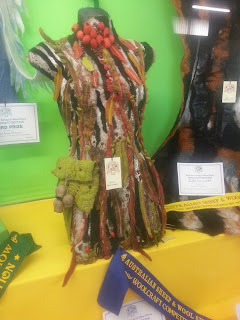 The Australian Sheep and Wool Show! 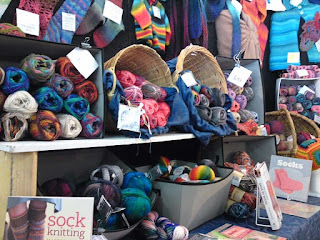 I was excited about this and have been looking forward to it ever since attending Knit Nation in London in 2011. That event pales in contrast to the Aussie version. From a small hall of stalls with a couple upstairs (I think they must focus more on classes or something) to the grand Australian shearing sheds--about three huge ones and four average ones plus some outside stalls--I was thrilled to be heading to Bendigo with my sister for a full day of roaming, observing, eating and buying. We headed off at about 8:30am for the 1.5hr drive there. I was tired from arriving super late after my flight had been severely delayed the night before but excitedly chatty. We found the place fine and paid our $20 to get in. My sister, Tam, always saves for this event and stocks up well to continue her hobby throughout the year. Being more than broke I hadn't had much of chance to save but I'd thankfully done a couple extra shifts during my month in Sydney and had some spending money too. 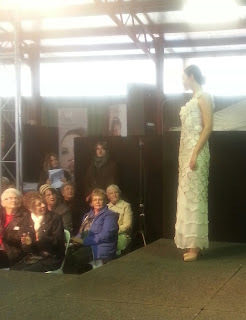 We headed straight to the fashion parade as we were right on time for it. Next was roaming the stalls. 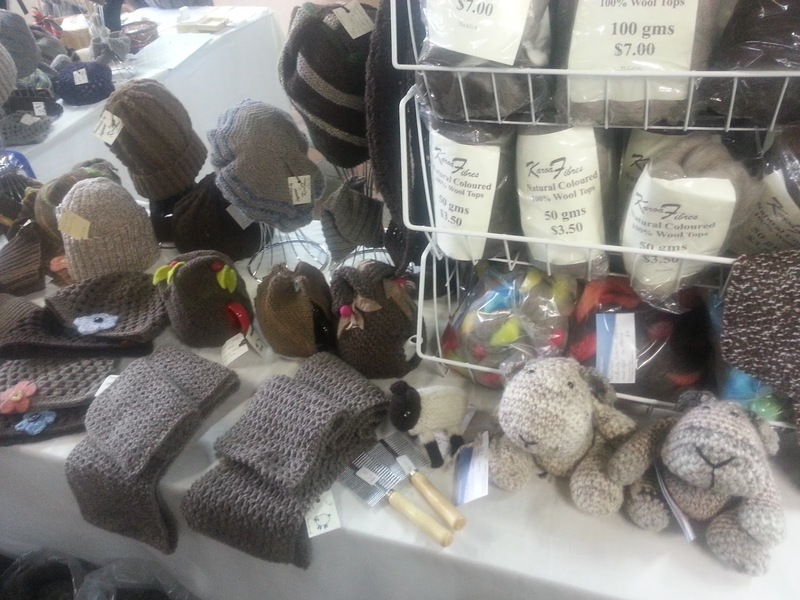 We went to another huge shearing shed that was full of stalls with yarnie/fibre goods. All for crafting with. There's always this one guy there who has fabulous wooden crafted knitting tools such as spindles, knitting noddies, ply gauges and more. This year he had these yarnie spikes that you skewer your ball onto and then as you knit and pull at the yarn it conveniently and smoothly turns. 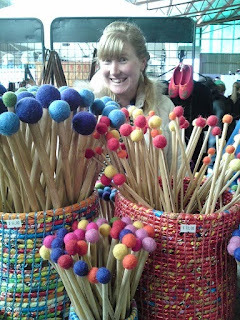 No more tangles and balls bouncing around the floor or resisting letting out yarn. We each bought one. That guys was also dressed in his awesome beanie and vest that his wife knit for him that makes him look like a viking--plaited beard and all. 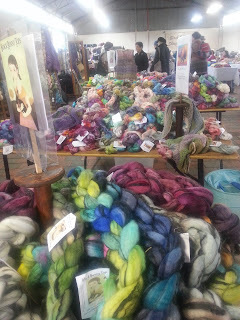 And there were loads of stalls selling yarn and fibre and needles and hooks and buttons and other fibre related goodies. We next went back to the fashion parade shed and there was a few good things there but most of the stalls were actual items of clothing and as yarnie crafters ourselves we were after supplies. We went down to the smaller halls were there were more stalls and demonstrations. One of the sheds was the competition shed that had all the entries displayed and the notices of which items won first and second place. That's always interesting to look at and see what others have masterfully created. Such a variety and things I've not thought of trying. We deliciously refueled with nacho baked potatoes before setting out again picking up more bargains along the way. It was the perfect day for it. 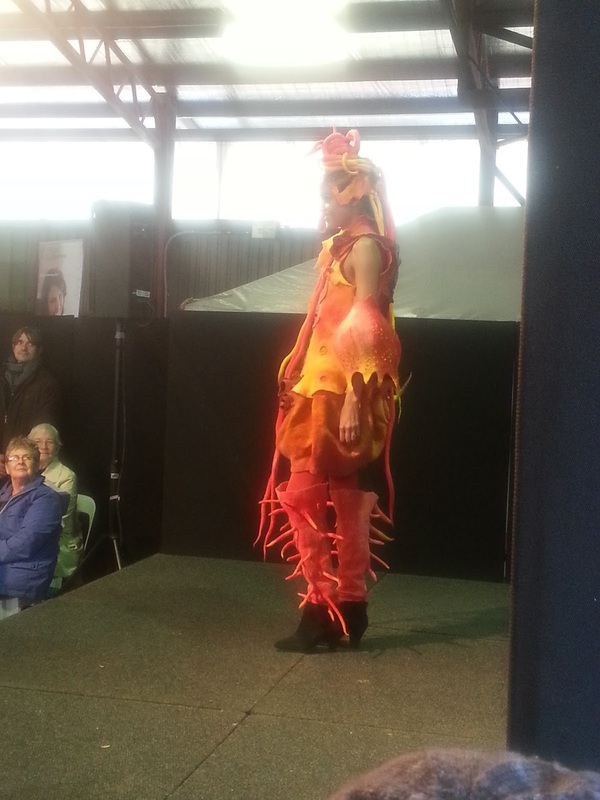 Cold so everyone was happily wearing and displaying their wooly creations. A tad wet but not too bad. We didn't bother looking in the animal tents this time. I finished spending my money just as it was coming up to closing time. 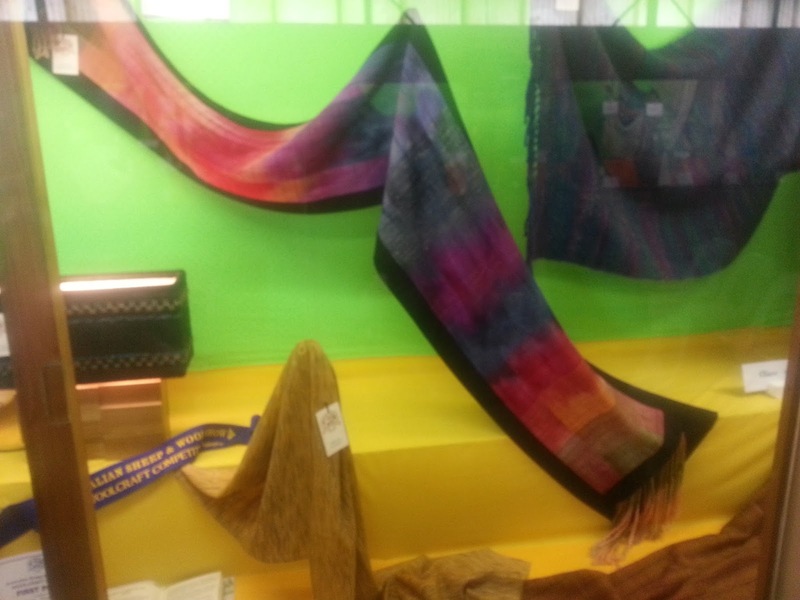 We left rather happy with a very satisfactory day at the show. We stopped by a small hall where some others had some stalls. Tam bought a little more but I didn't think much of it and I'm not sure why they have their own thing going. 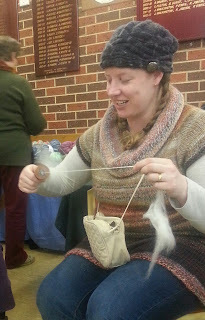 Tam also tried her hand at a different kind of spindle. You can't actually see it in the photo due to it's motion as it's spun around in her right hand. We didn't stay too long before making our journey home again. Back at mum and dad's we both came in and played show and tell. 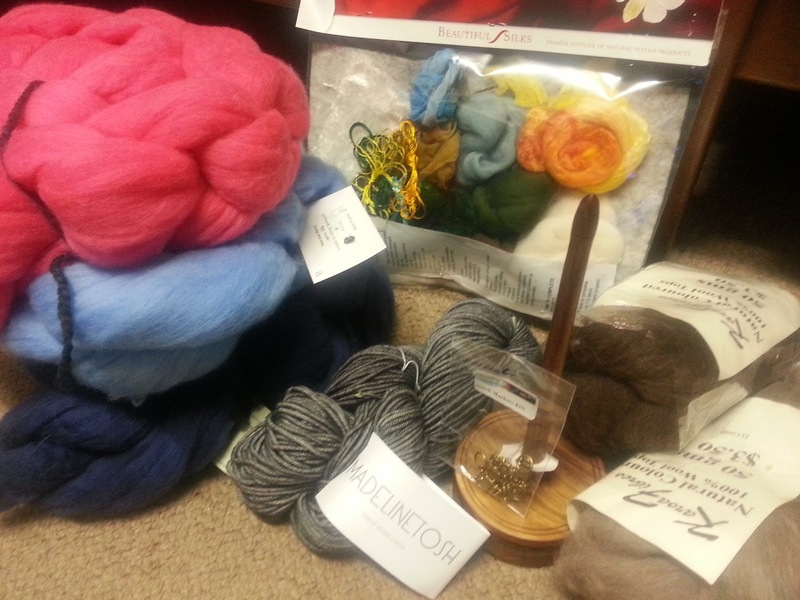 I'm quite happy with my loot though I didn't get the felting tools I'd planned to get. There just wasn't much there this year on the side of felting. 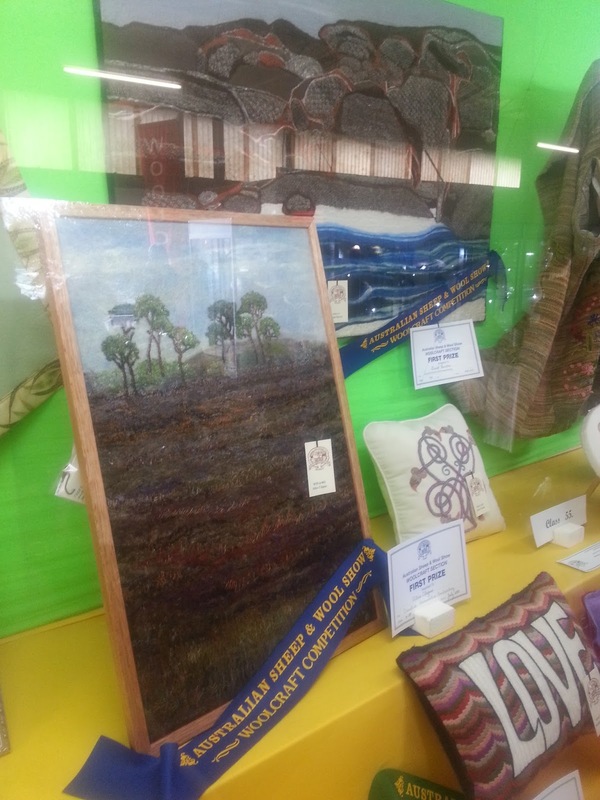 At least, not dry felting. But I got a bunch more fibre--all pure wool--plus a wet felting kit (to do one specific project). I got the yarnie spike I mentioned earlier and one skein of yarn (Madeline Tosh Vintage) and some cute robot stitch markers. I've now managed to pack a good stash of fibre and other crafty stuff into my suitcase for my return to Sydney. You can see even more pictures and read Tam's post of the same event here.